At Rice University an adaptive material was invented that combines self-healing self- reversible firming properties. 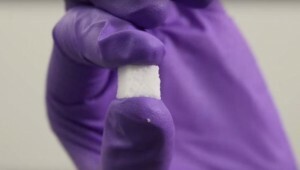 The material is called SAC: Self-Adaptive Composite. They are sticky, micron-scale rubber balls. This product is made by blending two polymers and a solvent which evaporates when heated. This creates a porous mass of sticky balls. If the crack it heals itself very quickly.